This is my second post for the day. My Simon Says Stamp Wednesday Challenge post is HERE! Welcome back! 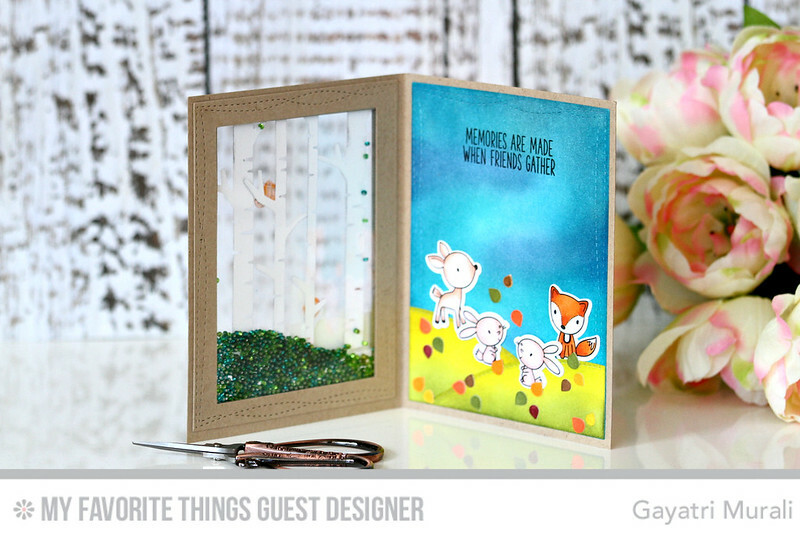 This is the final day of my guest designing at My Favorite Things Blog. I have couple of cards shared at the MFT blog, one of which I am sharing here with you. I was inspired byKimberly Crawford’s Peek a Boo window card. So I wanted to recreate it with my own twist to it. My twist is: I have added a shaker component to the window! I started with making the window shaker element for the card. I die cut the die namics Birch Treewith Smooth White cardstock. Sponged Hickory Smoke distress inks to give a bit more realistic birch tree look. I die cut a Wonky Stitched frame using two Wonky Stitched Rectangle die namics and Kraft cardstock. I adhered a clear acetate sheet behind the Wonky Stitched frame then the birch trees die cuts. I also adhered couple of birds stamped, copic coloured die cut from Sweet Forests Friends stamp set. I also created another frame using Stitched Wonky Rectangledie namics and adhered acetate sheet behind it. On a Kraft card base, I die cut a window on the card front using the second rectangle die namics. 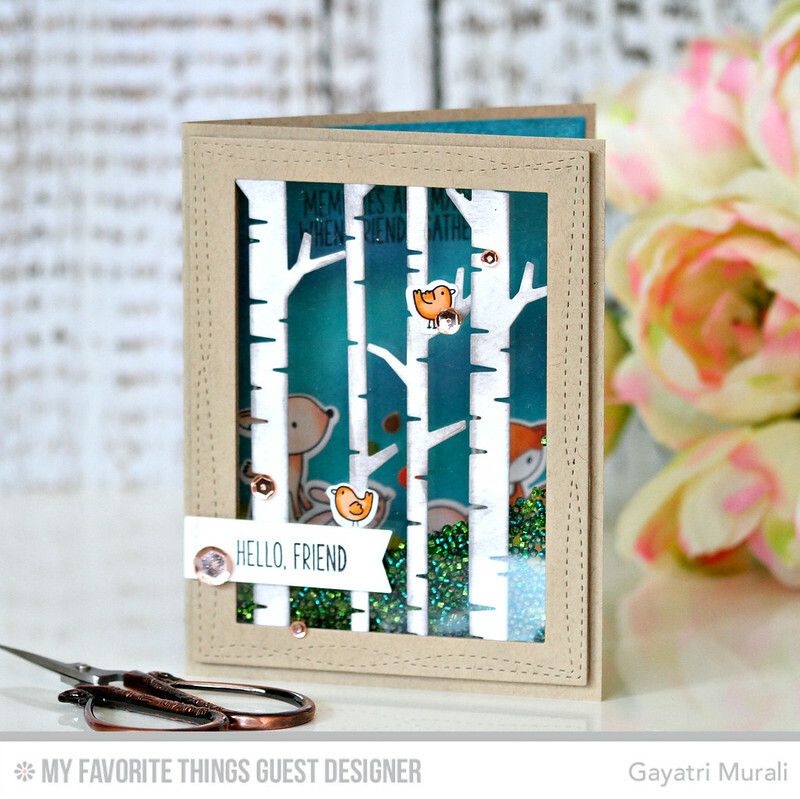 I adhered the birch tree panel I created on the card front using foam adhesives. After adding the Woodland Seed Beads, I adhered the second Stitched Wonky Frame panel behind the card front giving the window shaker box. I love this. So cool! On the inside of the card, I die cut the largest Stitched Wonky rectangle die namics using SmoothWhite cardstock, sponged Faded Jeans and Peacock Feather distress inks on the background. Then I die cut the die namics Stitched Valley using Sour Apple cardstock, sponged Mowed Lawn distress ink and adhered on the bottom of the panel. 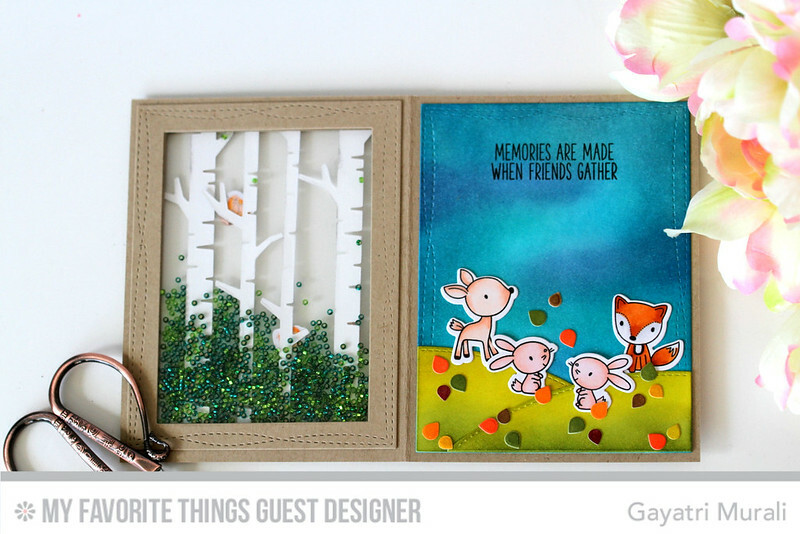 I also added stamped copic coloured and die cut fox, deer and bunnies images from Sweet Forest Friends stamp set. The Birch Tree die namics also has these cute little leaves dies. I die cut them using Smooth White cardstock, sponged autumn colours using distress inks and adhered them randomly on the landscape. Finally, I stamped the sentiment from the Sweet Forest Friend Stamp set on the top of this panel using Black LicoriceHybrid ink. For the front, I stamped the sentiment also from Sweet Forest Friend on Smooth White card strip, die cut using one of the dies from dienamics Blueprints 29 and adhered using foam adhesives. Finally embellished with Rose Gold sequins from Pretty Pink Posh. Hope you like my card. Head over to My Favorite Things Blog to see the other card. I throughly enjoyed working as Guest Designer for MFT blog and very thankful for the opportunity! Love it! 🙂 So fun! 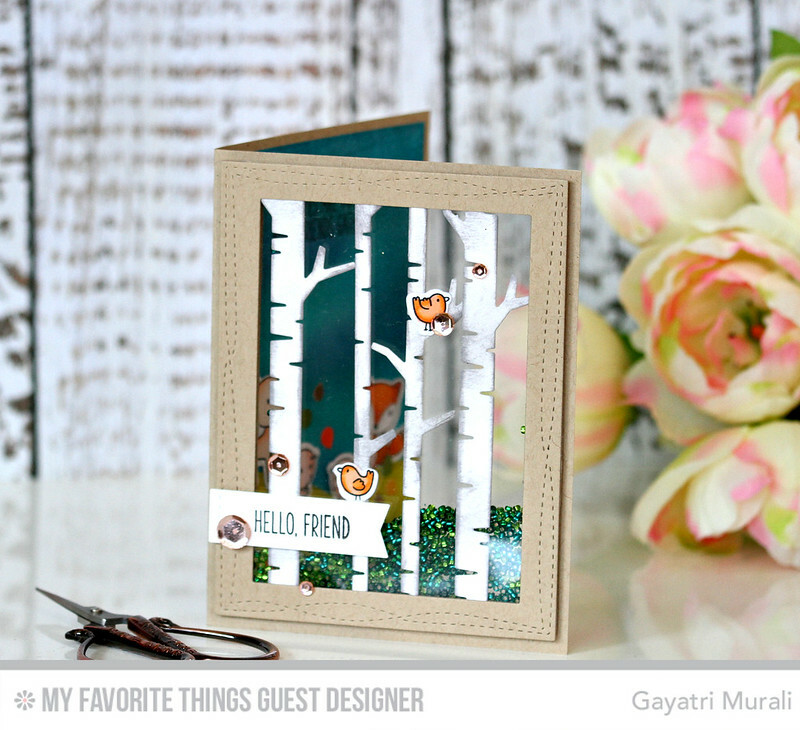 What a great card Gayatri.